New York City Ballet's Olivia Boisson. Photo by Melika Dez, Courtesy Black Iris Project. In 2016, choreographer Jeremy McQueen founded the Black Iris Project with the aim of bringing together predominantly minority dancers each summer to create works that celebrate diversity and black history. This year, he's mixing it up. In honor of South African anti-apartheid leader Nelson Mandela's 100th birthday on July 18, McQueen created 100 FISTS in collaboration with photographer Melika Dez. Each day, for the hundred days leading up to Mandela's birthday, BIP has released a photo on social media of a black dancer in a New York City location, posed with their hand in a fist. Each photo is paired with an inspirational quote by Mandela. 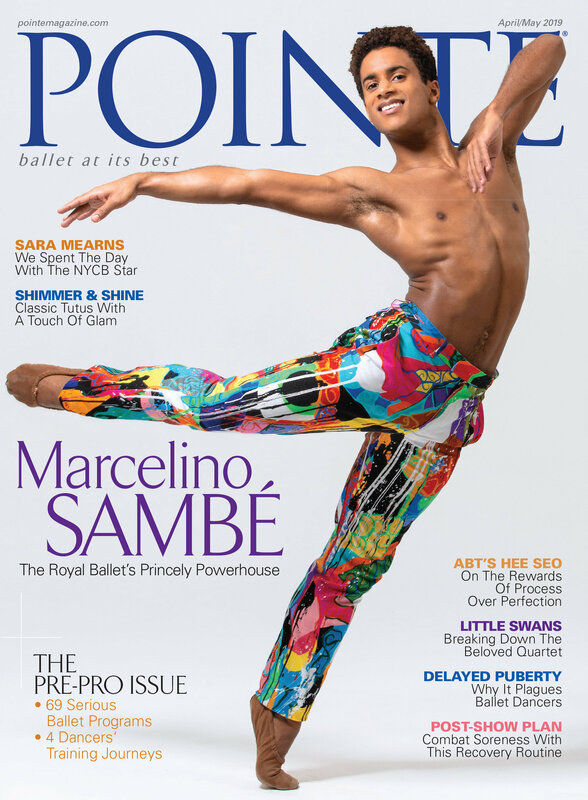 Pointe caught up with McQueen to find out how this project came together and what's next for the fledgling collective. Following principal dancer Diana Vishneva's final bow with American Ballet Theatre and the news that principal Veronika Part's contract would not be renewed for another season, we were anxiously awaiting ABT's promotions for the 2017-2018 season. Ending our suspense, ABT's artistic director Kevin McKenzie officially announced that there would be three new female principals—Sarah Lane, Christine Shevchenko and Devon Teuscher—as well as one new male soloist, Calvin Royal III. Copeland and Royal run through their pas de deux. Photographed by Amitava Sarkar for Pointe. Imagine having your first show with Misty Copeland inches away from you onstage. Copeland and her prince, American Ballet Theatre corps member Calvin Royal III, swooped into Houston, Texas, in November to dance in Open World Dance Foundation's new, full-length production of Cinderella. Choreographed by OWDF directors Ekaterina Shchelkanova and Anton Boytsov, the community project showcased 123 local children of various backgrounds at The Hobby Center for the Performing Arts. Some had no previous dance experience. Sarah Lane as Aurora in ABT's Sleeping Beauty. Photo by Rosalie O'Connor, Courtesy ABT. Lately, it seems like mentorship is having something of a moment: Many pro dancers are coming up with creative ways to give back to the dance community and act as a resource for young students striving to reach the top. Take Kathryn Morgan, who started her own blog and YouTube channel to pull back the curtain on the ballet world, and writes an advice column for Dance Spirit. Or David Hallberg, who's opened up about the challenges of being a young male ballet dancer, and worked to mentor boys at American Ballet Theatre's Jacqueline Kennedy Onassis School. Or New York City Ballet principal Megan Fairchild, who shares advice in her "Ask Megan!" podcast.